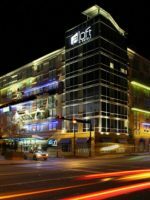 Looking for a centrally located hotel in downtown Tallahassee? 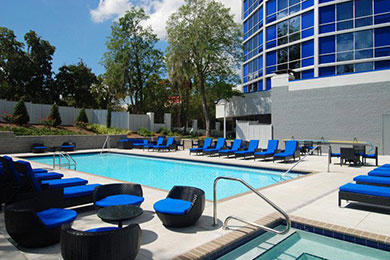 Consider a stay at the Four Points by Sheraton Tallahassee. 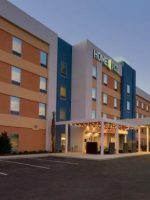 The hotel is within a short drive of area attractions that include the Tallahassee Museum, where you’ll find zip-lining adventures and animal encounters, and Railroad Square Art Park, a gentrified neighborhood with boutique stores and more. Because the hotel is housed in a round tower, its rooms are seemingly larger, too — a bonus for families. 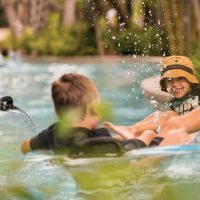 Other perks include a resort-style pool, superb onsite restaurant, bike rentals, free parking and the ever-important free Wi-Fi. The hotel is pet-friendly, too. Hotel rooms range between 315 feet (Traditional, Deluxe) to 630 feet (King Suite); they are fairly modern. All offer free Wi-Fi. Cribs are available upon request; the hotel does not offer rollaway beds. The Traditional Room has one king bed and sleeps two people. Accessible options are available. 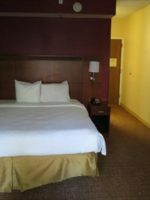 The Deluxe Room provides two double beds, as well as a mini-fridge and microwave. 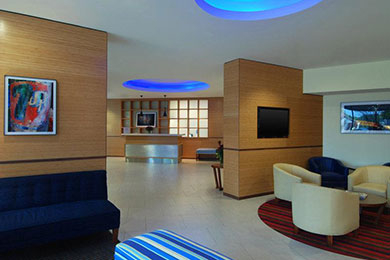 Deluxe Rooms are located on the upper floors of the hotel. Accessible options are available. Spring for a King Suite, which provides 630 square feet of space for families to spread out and relax. Upon entering the room, you'll find a kitchenette (mini-fridge, microwave, coffeemaker and pantry) and dining table for four people, along with a sleeper sofa and flat-screen TV in a living area. The King Suite also has a private bedroom with a king bed. The bathroom is spacious and has a shower/tub combo. The staff is very attentive and available and we were treated very well. We booked the Presidential Suite, and while this is not a premium property, it was still very ample and comfortable with a full kitchen, dining and living areas. The bathrooms are configured somewhat awkwardly but still, and in the balance, it was an enjoyable stay. 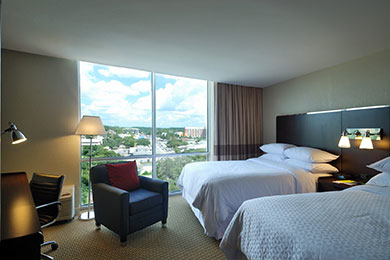 Convenient location and very quiet with great views of the Capitol from the 12th floor! Would consider returning again if in the area. Time to freshen up the rooms! The rooms need to be remodeled. My room was looking tired and old. Bathroom lights had rust on them. Took what seemed like forever to get the warm water to the sink and shower. Fitness center was also in dire need of a refresh. Ample size, poor use of space. On the positive side the beds/pillows were great. Staff was excellent too!! Great staff. When you're not exploring the area, relax and refresh in the outdoor swimming pool and hot tub. Bike rentals are available on a first-come, first-served basis daily (unavailable at night). All you have to do is sign a waiver. Unfortunately, kids' seats/bikes are not available. 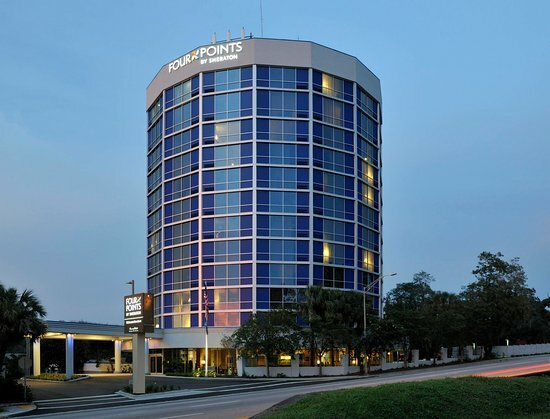 You don't have to leave the Four Points by Sheraton Tallahassee for a good meal! Juicy Blue serves breakfast, lunch and dinner between 6 a.m. and 10 p.m. daily. Lunch and dinner options include everything from salads and burgers to pasta and steak entrees. Kids' menus, highchairs and in-room dining are available. Wi-Fi is free for all guests of the hotel. The hotel has a small fitness center with a few cardio machines and free weights. It's open 24 hours. Pets that weigh up to 40 pounds are welcome to a stay at the hotel; the cost is $25 per day. 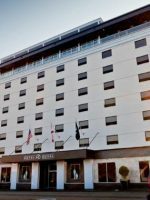 In terms of rates, it's cheapest to stay at the hotel (and most area hotels) between May and August. It's also hot -- really hot. Plan a visit in the fall or late-winter for the best weather. The closest airport to Tallahassee is Tallahassee Municipal Airport, a small airport with one terminal. 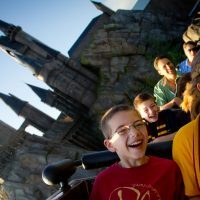 There aren't any other major airports nearby, so you'll likely need a connecting flight in and out of Florida's capital city. 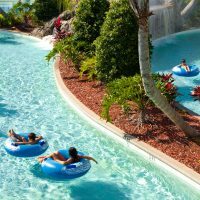 The closest major airport is Jacksonville International Airport, about two hours away. 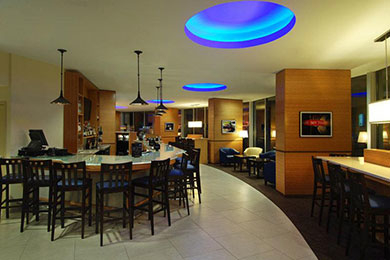 The hotel's exceptionally friendly staff will assist in arranging airport transportation. Guests are also welcome to utilize the Ribit Ride -- a golf cart that travels to local attractions. Sneak down to Juicy Blue for a nightcap. It's open until 11 p.m. on weeknights and midnight on weekends.